India and its subcontinent is known for its big fat wedding where both the groom and bride spend exorbitantly. The obsession for expensive clothes, jewellery and other things at the wedding just can't fade away. The most important thing in these lavish wedding is gold, which takes beats everything at the wedding. The gold jewellery is a significant of any wedding; class and caste doesn't play much role while dealing with jewellery. 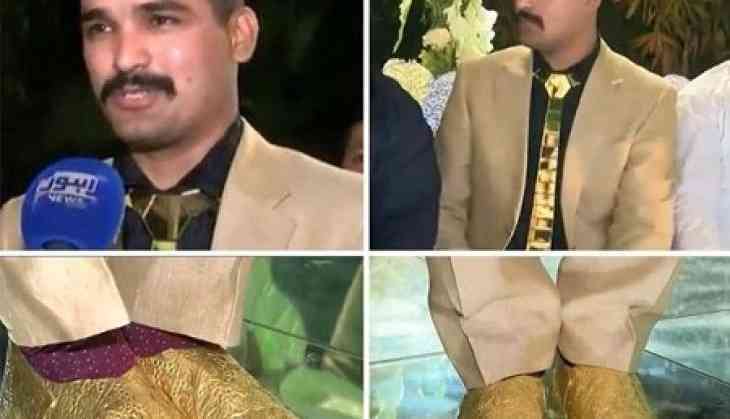 In a recent wedding in Pakistan, the groom Salman Shahid spent almost 25 Lakhs on his outfit. A businessman from Lahore, he wore a flashy suit which is made from gold at the reception. A matching tie enchanced with gold crystals. To make the look more rich and flashy, he wore shoes made out of real gold. You must be thinking, what did the bride wore at the wedding? As per the reports, the total cost of the grooms cost is 63,000 Pakistan rupees as the it is decorated with crystals and jewels. The shoes which are made out of 320 grams of real gold nad they costed whooping PKR 17 lakh. The entire outfit of the groom costed 25 lakh Pakistan rupees. About the outfit, the groom said, "I always wanted to wear gold shoes. People wear it around their neck or as a crown. I wanted to tell people that wealth is like the dirt on your feet, it should stay there". He repeated the statement again, "...and I always wanted to wear gold shoes". The exorbitant outfit is trolling on the social media with mixed reactions from the people. A person on Instagram said, "One can pay for a surgery by selling one shoe. Another wrote, "I would like to see what the bride wore if the groom had such nakhrey (tantrums)!" Salman Shahid, the groom was also accompanied by several securitymen. You will be surprised to know this, despite the fact that the groom wore gold shoes, the joota churai ritual went as planned.